For many guys buttonholes are a bit of an after thought, something they are told they should wear by mums and partners, but they don’t have to be boring. I always try to make the groom’s buttonhole reflective of the bridal bouquet but also a little special as this is really the groom’s version of a bouquet. Stories differ as to how the tradition of pinning flowers to your lapel started, but some say that buttonholes date back to ancient Greece. The male wedding party members would wear a small bunch of flowers, usually mixed with fragrant herbs, pinned close to their heart in order to ward off evil spirits. It was believed that these evil spirits would cause the groom to turn his heart against the bride and refuse to love her. Whatever you believe the origins to be, buttonholes are still popular today, and it is worth noting the story if only to remind you to pin the buttonhole on the left hand side (the same side as your heart ). Other people have said men should wear buttonholes on the left side because women are always right, but I’ll leave that interpretation up to you! Traditionally men would wear a single, rose, carnation or in Scotland a thistle, but nowadays it is much more popular to have a more natural looking gathered style of buttonhole below. These bunched buttonholes suit a more rustic or naturally styled wedding and have the benefit that you can keep them in water (like a mini bouquet) right up until you pin them on. In contrast traditional wired buttonholes cannot go in water but do provide more support (due to the wiring) throughout the day. When choosing your buttonhole ingredients it’s worth remembering that buttonholes have to put up with a lot. 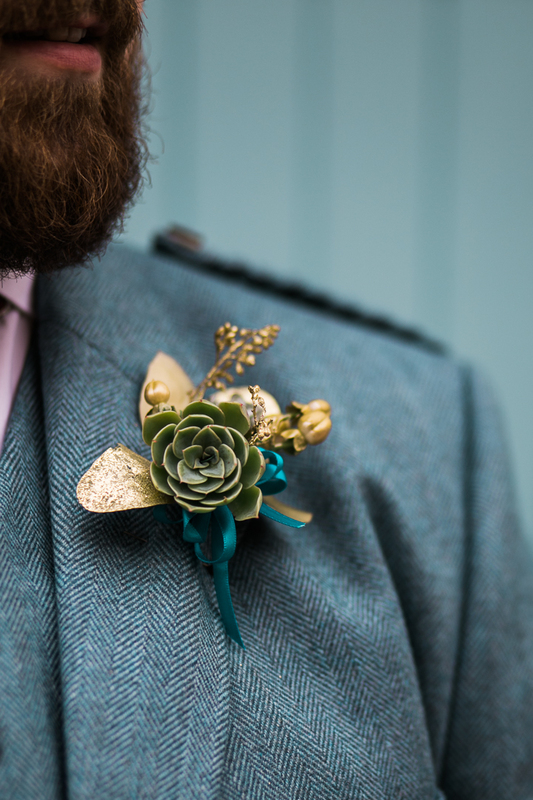 They are pinned on a warm body and often knocked and squished in man hugs throughout the day, so I find using hard elements like succulents, lavender or dried elements mean that your buttonhole survives for longer. Pale flowers and roses can bruise easily, and likewise some off the beautiful images of wildflower buttonholes on Pinterest are misleading as they are taken for a photoshoot but would never last the rigours of a full wedding. Another option is to order two buttonholes for the groom so he can have a pristine version for the official photographs! Perhaps some of my favourite buttonholes have been a little quirky, for example I had a bride whose bouquet was designed to cascade out of a teapot, her bridesmaids’ bouquets were in teacups and so I used dolls house china to add mini teacups and a teapot to the groom and bridal party’s buttonholes. Earlier this summer a book loving bride wanted me to include a paper rose in her bouquet taken from the pages of her favourite book so I made a matching mini one to go in her groom’s buttonhole. In other examples I’ve included pine cones, feathers and even scrabble tiles. So when it comes to buttonholes, be creative, it doesn’t have to be boring! Thanks to Lauren McGlynn Photography who captured my gold and succulent buttonhole at the start of the blog, and The Gibsons for the image of my popular wheat, lavender and thistle buttonhole.